Here is part two of this series. In part two I explain the reason for part three. The thing about part three is that it was written 16 months ago and it was never posted. I didn't feel good about posting it. But I wasn't sure about that. So I asked a close friend and some family what they thought, and they agreed that, at the time, all things considered, I probably shouldn't post it. Upon reexamination, and taking into account the current woes for Mark Driscoll and Mars Hill, it looks like its publish date has come. Part three is a longish examination of my process in sorting through the pain of my church experience, examined through the lens of a detailed account of one of the first Mars Hill pastors to be fired for a "lack of trust and respect for spiritual authority." 16 months ago was about 14 months after we left the church. Why am I going to dust off this piece of my writing, pull it from the trash heap, as it were, and share it with the world? Because I have learned something from the "pile of dead bodies" that have been hemorrhaging out of Mars Hill for years that have now come to a head (or are at least approaching one): sharing your story is important. Sharing your story can bring a measure of comfort to someone else. It let's them know that they are not alone. I know that just reading the stories of people who endured a similar experience to my own of spiritual abuse has heartened me greatly. What's the difference between sharing your story and gossip? Well, situations are like people—each one is different. Each one requires its own unique prescription for remedy. Systematic and/or structural Authoritarianism (which, in a church, often expresses itself in the form of spiritual abuse) is nowhere near the same ballpark as your run of the mill interpersonal squabbles with friends, family, and coworkers that we come across every day. Different situations, different measures. I don't think it is right to talk behind people's backs—I do think it is right for people to tell the truth about unreconciled abuse they have endured. My main concern in posting this piece 16 months ago was that it would be viewed as possibly divisive, stirring up a hornets nest, gossipy, whatever. And maybe that's what it was 16 months ago. But another year of healing has gone by (the wound is still there, and it is considerable, but when I think of the last two and a half years I am so thankful for all the healing that has taken place). 16 months ago I was afraid of looking bitter, of looking for vengeance. Now I know and see that is not at all where my heart was at. 16 months ago was just a realization for me that spiritual abuse was every bit as real and significant (not in its effects, but in its very existence) as physical, sexual, verbal, or any other kind of behavior that is abusive. All of these forms of abuse are wrong. All of them need to be addressed and extinguished when detected (this is the ideal outcome, rarely the actual outcome). All of them require their own set of guidelines to be addressed, accounted for, and restitution made. 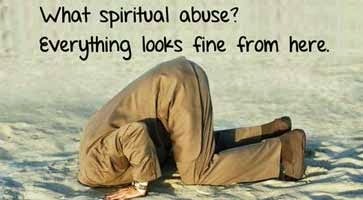 Why would spiritual abuse be any different? Because we don't have a language for it. You don't hear the term very often. It's nebulous. It is incredibly hard to distinguish it from all of the trappings it comes packaged in. "Spiritual abuse happens when a leader with spiritual authority uses that authority to coerce, control or exploit a follower, thus causing spiritual wounds." That definition was written by Ken Blue, author of "Healing Spiritual Abuse." It was selected from the dozen or so definitions listed on this helpful website. This particular definition best describes my perspective on the abuse, but they all are good. All are getting at a practice that is as insidious as it is common. So that's the problem. Spiritual abuse happens. Part three is a distillation of my reaction to it, a first hand account to be placed in concert with all the other exiles, present and future. Part four will be thoughts on what we are supposed to do about it. The title for the piece I never posted was "Devastation."